Place sugar, butter, milk, honey & egg in a large sauce pan. On low heat, stir constantly until melted. Now add baking soda and keep stirring until foamy (do not boil). Take off of the heat. Stir in ½ of the flour. Transfer the rest of the flour on your work top and pour the mixture over. Form into a dough/pastry. Divide this into 2 equal halves and shape them into rectangles. Roll until you have a very thin sheet of pastry. Check for the size of the largest baking tray you have and roll the pastry out to fit it. Transfer it onto the tray (well-oiled or lined with baking paper). Bake at 180C/356F for 10 minutes per tray. Once ready, take them out and let them cool completely before filling. Cream the icing sugar with soft butter using a mixer. Add pudding (at room temperature) in stages until you have used all and you have nice thick mixture. Place the first cake base onto a tray/chopping board or anything that you will be able to fit in the fridge. Cover the first base with pudding filling. Cover with the second cake base and cut in half crosswise. Spread jam over one of the halves(the more the better). At this stage you will see if you have still some filling left. If yes, you can spread it over the jam. Now cover with the other half that has been already filled. This is ready to go to the fridge. Place a sheet of baking paper over the cake and weigh it down with a chopping board (or anything that puts a bit pressure on the cake). Keep in the fridge overnight. Bring whipping cream to a boil. Pour it over finely chopped chocolate and let set for 2 minutes before mixing until the chocolate has dissolved completely. Return to the fridge for the chocolate to set. Once set, trim off the edges and slice into individual portions. 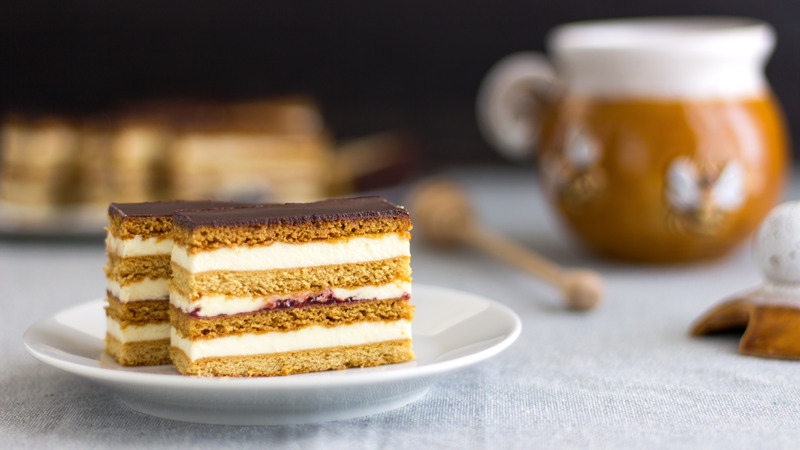 The post Honey Cake Slices – Slovakian Petit Four appeared first on HappyFoods Tube. Rich & creamy petit fours. 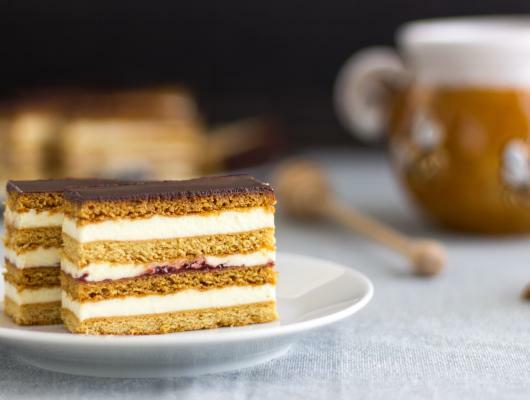 Thin Layers of baked honey flavored pastry are filled with pudding filling, jam and finished off with a chocolate.